YOU MUST SUPPLY YOUR OWN DRILL TO USE WITH THIS AUGER. The 2.00'' inch Garden Auger features a thick, hardened, knife-like cutter blade that slices through harder ground and clay. Designed with three flats on the end of the shaft to keep the auger from slipping in your drill chuck. 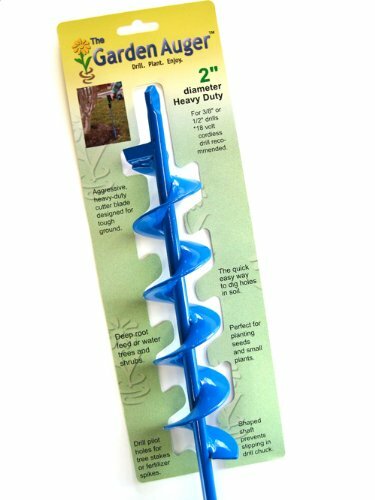 The 2" diameter Heavy Duty Garden Auger by Custom Auger Systems is the perfect planting auger for smaller bulbs like the crocus or miniature dahlia and gladiolus. Also an excellent tool for drilling pilot holes for tree and fertilizer stakes, and installing termite bait stations. Fits household drills 3/8" diameter and larger. Any corded drill provides plenty of power; if using a cordless drill, an 18 volt DeWalt or Milwaukee is recommended. ANY corded drill that has a 3/8'' or larger chuck will be able to power this earth auger. If you want to use a cordless drill, we recommend an 18 volt, good brand name drill like a DeWalt or Milwaukee. Check closely when you chuck the drill up on the auger shaft- the flats on the end of the auger shaft should match up with the flats of the drill chuck. Failure to match the flats of the auger shaft to the drill can result in a loose auger that could spin in the drill chuck. If the auger does not seem to penetrate the ground when you start drilling, check to see if your drill is in the reverse gear. A garden auger will not dig if the drill is in reverse. Know where your electric and gas lines are buried, and always wear safety eyewear. You should use your drill in the lowest gear setting possible. If you have any questions about this product by Garden Auger, contact us by completing and submitting the form below. If you are looking for a specif part number, please include it with your message.